snips snippets: Wip Wednesday - the disorganized chaos, let's pull out all the projects and procede to get nothing done edition. Wip Wednesday - the disorganized chaos, let's pull out all the projects and procede to get nothing done edition. So this was the start of my day today. One of those days where you pull out a whole whack of projects and just hope that you can get one off the list. I wasn't successful. I started thinking that i should get the next six filler blocks for my Gypsy Wife quilt taken care of. I had already pulled the fabrics and was hoping to get them sewn up today. I managed to get them all cut out, but not sewn... maybe tomorrow. I also needed to pull fabrics for a replacement block. I've decided that the little economy block with the yellow up at the top and the larger block right below it need to go. The yellow isn't the right shade of yellow, and the teal in the other block is just throwing things off. Here's a shot without them. Much better! So i've pulled and cut the fabrics for replacements and i may or may not get them sewn tonight. The boys are spending the night at my MIL's house and this is the very first time they've slept over somewhere without me. gulp. I don't see a lot of sleep for me tonight. I had a couple projects on the go today that i unfortunately can't show yet. Some photo's needed to be taken for a tutorial i'm working on for the Q1 Finish Along Tutorial Week over at The Littlest Thistle. Some finishing touches on a gift that is way, way over due! but i can't!! Soon though. I also have some other finishes that i just haven't had the time to take photo's of, maybe i can get my act together tomorrow and sort some of them out! Along with some pics of my little Max's bday party and gifts. I've been pretty MIA on the interwebs lately, and not just here. Now that my guys birthdays are done, i'm hoping to get back to normal around here. I just haven't had the time visit all my regular blogs and i miss it, and you guys!! Hope you've all had a great week so far! We went from playing outside yesterday in spring jackets to a full on snow storm today... i am desperate for some warm weather and sunshine, how about you?! Linking up with Lee over at Freshly Pieced for WIP Wednesday!! I think that the color collage in your photo with the blocks pulled is much more cohesive. It sounds like you are really busy and I'll look forward to seeing what you can share of the other projects in the future! Great to see your progress on your Gypsy Wife quilt. Lovely colours and some shrewd editing on that yellow block! All your sneak peak are looking good and I agree with you on that yellow and teal block. Good luck with the rest! I was trying really hard to like the bright blue and bright yellow, but I think your blocks look better without them. Maybe if there is more of the vivid blue scattered around the place? It looks like you kept yourself busy! So no time for tears :-) To paraphrase a fabulous movie - just keep sewing, just keep sewing, sewing, sewing, sewing. Hope the boys (and you) survived the spend-the-night. And hang in there, I have, like, 30 WIPs going right now. Well, maybe not that many, but it feels like it. Sounds to me like you did get a lot done! 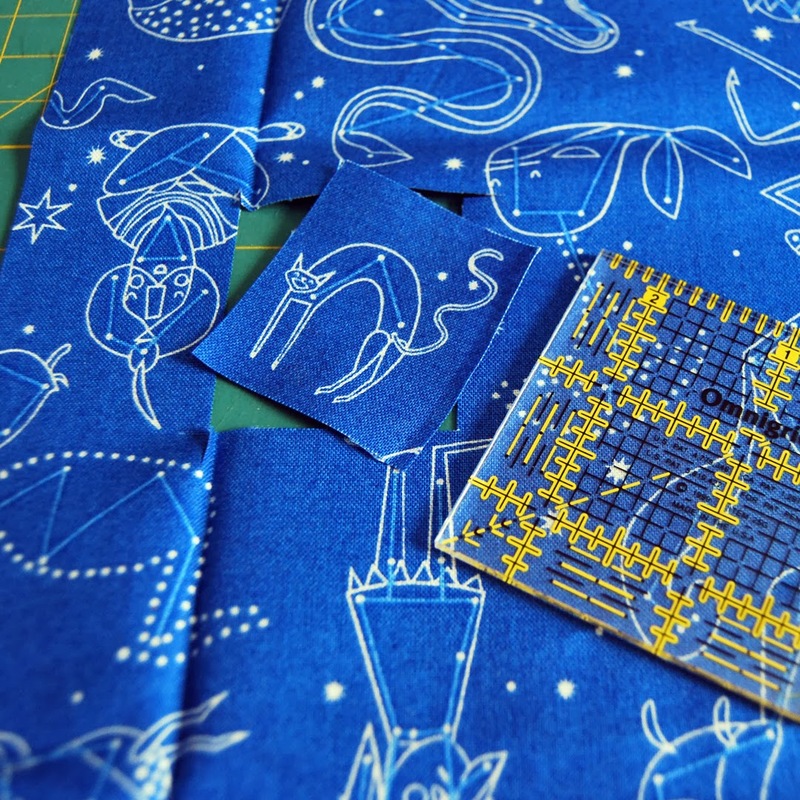 And time spent playing with fabric, whether stuff gets finished or not, is always a good thing! Looking forward to seeing those projects in the Quilting Project Protection Program! All we've had this winter is sunshine and warm--which is nice to get the kids out to play and work in the yard, but really it just means a really bad fire season for the next like...6 months. Maybe we'll get some nice spring showers? Not likely. You gypsy wife quilt is intense! I do agree with taking out those two blocks. The teaser pictures for the other projects are all so cute! Well for saying you don't have your act together, a normal person would say - uh, yeah ya do! Love your blocks and the arrangement! Really great - love the header of your blog too! Can't wait to see all the secret sewing! Loving how the Gypsy wife is coming along. All good stuff. The weather is a real bummer here too. Snow and ice one day - beautiful sunny weather the next. We're getting to spring, it will be over soon and we'll all be miserable because it is too hot! I love how the gypsy wife is coming along. I agree with you, the second photo is better. I love sneak peaks. 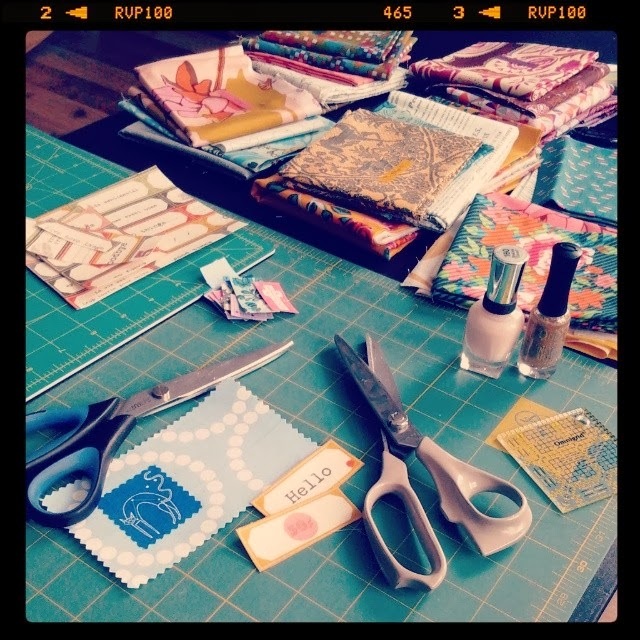 Can't wait to see what's been going on in your sewing room.